I was introduced to this dish in Gokarn, during my first six month trip to India in 2001. Shanker, a great friend who managed the beach side guest house cooked it for me one evening after the sunset. Gokarn is a tiny holy town, south of Goa and auspicious to Hindus; a dip in the sea is good luck for one’s father and the sea washes away sins. It’s a town i fell in love with. I ended up staying for four months! I have since returned almost twenty times and whenever i do i eat Beetroot Curry. 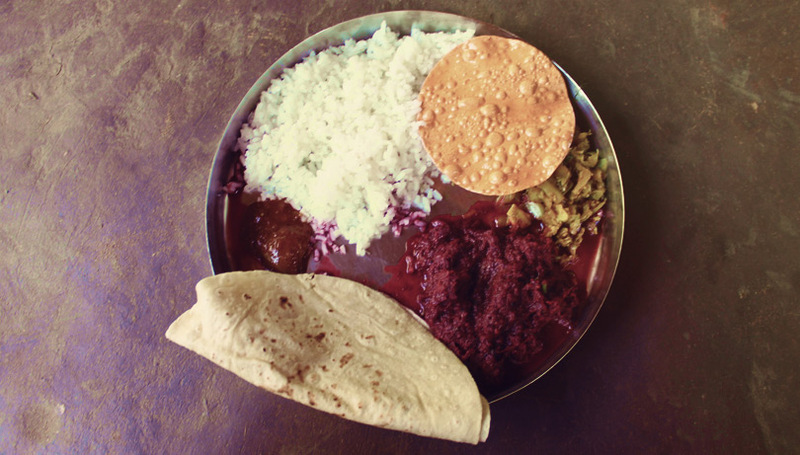 The food in the photograph was cooked by Nela, Shankers wife, at their home in 2012. Peel and grate beetroot and leave to one side. Grate ginger and garlic or grind into a paste. Chop onion, pepper, tomato, chilies and prepare coconut. Basically everything needs to be ready to go into the pan fast. Heat oil on high heat and add black mustard seeds until they crackle. Add cumin , chili and onion and fry until soft. Add ginger/garlic and fry for one minute. Do not burn. Add asafoetida or turmeric and the sliced tomato and green pepper. Fry for three minutes. Ad salt. Add beetroot, coconut and a little water. Cover and cook until beetroot is cooked. Around 10 minutes. keep stirring. Serve with fresh coriander and home made chapatti. Loving the sound of this and as a vegetarian a good one to try. Thank you for sharing. It’s a really special recipe for me, written down for a friends food blog. Shared for beetroot and curry lovers to enjoy! Looks, and sounds, so GOOD! This looks amazing, will definitely try it out! Fantastic. Do let me know how you like it! Mandela + Minogue = Rihanna!